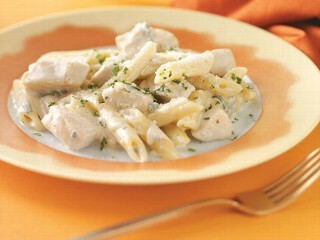 This Gorgonzola Penne with Chicken dish won $25,000 in a recipe contest through Taste of Home. $25K? Dang. Since it was deemed worthy of the hefty monetary prize, I had to try it. I'm not a big fan of chunks of chicken in my pasta, so I subbed in shrimp instead. The prep was simple and the cooking was easy. I'd say it turned out pretty freakin' tasty. Even my lactose-intolerant friend scarfed it down, knowing full well what the consequences would be. 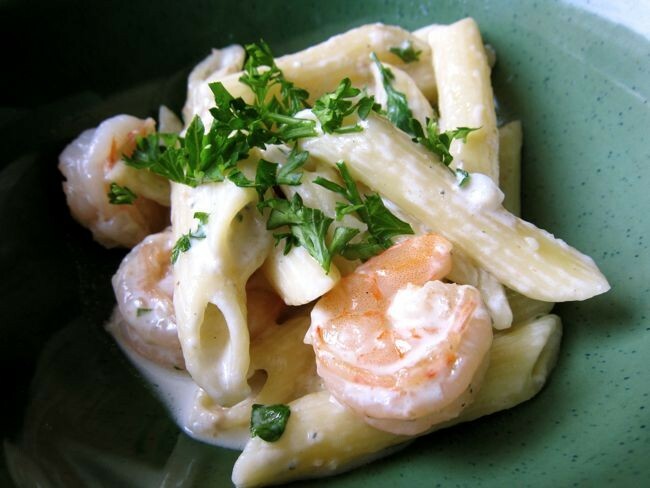 Penne pasta and shrimp are tossed with in pungent Gorgonzola cream sauce, made of cream, white wine, sage, and garlic. Thanks to the addition of the light orange shrimp, the dish wasn't completely a monochromatic and bland white. Meanwhile, in a large skillet over medium heat, cook shrimp in oil until slightly pink. Add garlic; cook 1 minute longer, or until shrimp is almost cooked through completely. Remove shrimp from pan. Using the same pan, add wine, stirring to loosen browned bits from pan. Add cream and broth; cook until sauce is slightly thickened. Stir in the Gorgonzola cheese, sage, salt and pepper; cook just until cheese is melted. Drain pasta. Add shrimp and pasta into sauce in pan. Heat and stir for a minute or two. Sprinkle with Parmigiano-Reggiano cheese and parsley. In a small bowl, combine vinegar, oil, salt and sugar; mix well. Add apple, onion and raisins; toss lightly to coat. Cover and let stand for 10 minutes. 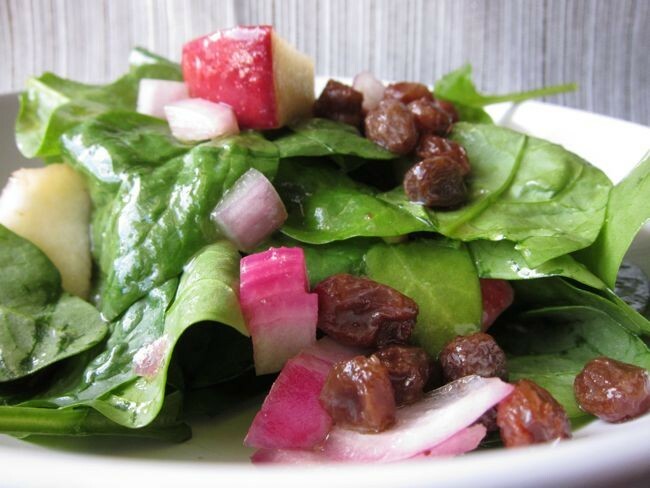 Just before serving, put spinach in a large salad bowl; add dressing and toss.